The fewer component parts a dish has - or anything else, for that matter - the greater the potential there is for it to be fretted over and fetishised. Just look at the amount of (bearded) chin-strokery that now goes into producing beer, a product that in most cases consists of just four things: water, malted barley, hops and yeast. A cooked steak essentially consists of just one thing: a hunk of dead cow. But from which breed did the beast originate, where did it live, and what did it eat? And, once it met its maker, how was it hung, and for how long? Most important: which bit of the cow did it used to be? Finally, what did the chef use to cook it? There are people who take a geekish amount of interest in these minutiae. Guilty as charged. Which is why it’s really important to any foodie (other than veggies, of course) when there’s a new place in town where they really care about the details. 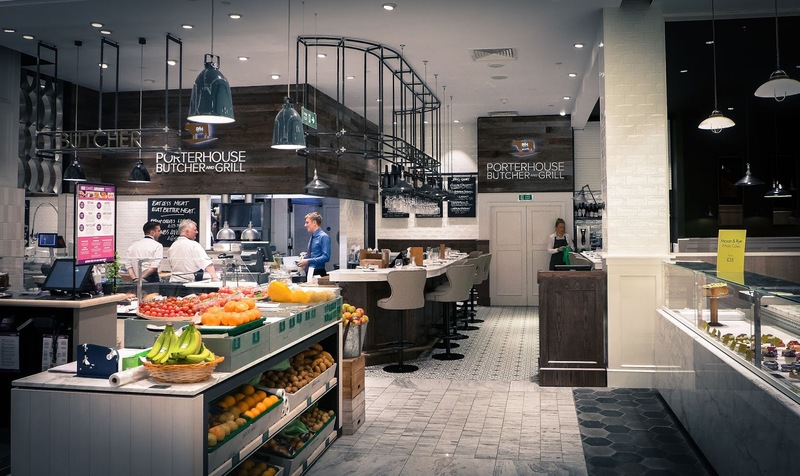 Porterhouse, Terry Laybourne’s new place in Fenwicks Food Hall, is one such place. 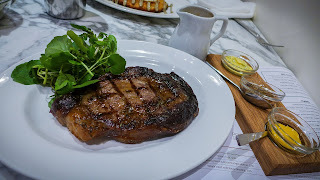 The first bite I took (Peter Hannan’s Glenarm Estate, aged 36 days in a Himalayan salt chamber, rib-eye, cooked to rare on a Catalan charcoal-powered Josper grill, seeing as you ask) was a bit of a moment. There may even have been a couple of softly murmured expletives. It had a denseness of flavour and profound, charred beefy richness that justified the not insignificant cost (£25.60). In short, it was magnificent. 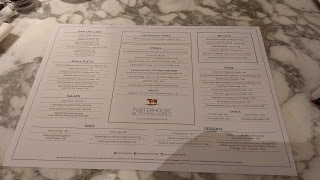 But it’s not just all about the steak at Porterhouse. On paper, this is one of the most appealing menus I’ve seen for some time. I have to say on paper, because, a couple or so weeks after opening, not quite everything we tried was singing and dancing. Sourdough bread, from the Food Hall’s own Mason and Rye was very fine. 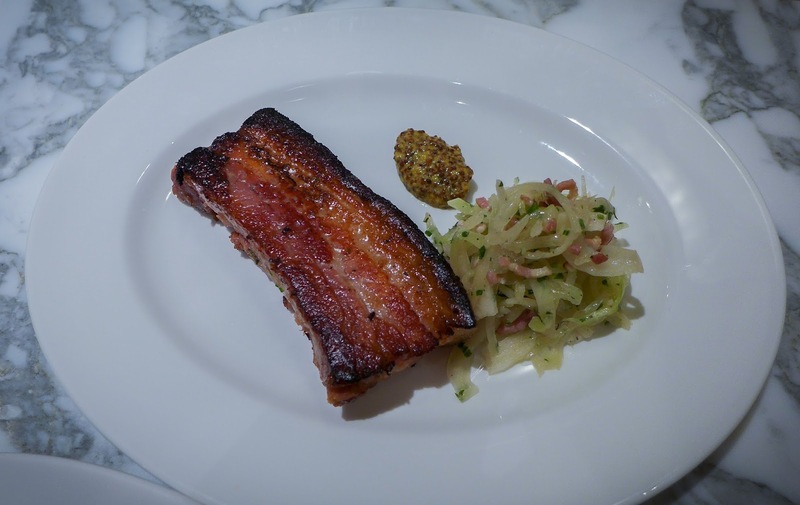 I jumped at the chance to have it served with schmaltz, that glorious lotion of rendered chicken or goose fat that’s a traditional dish of Ashkenazi Jews. 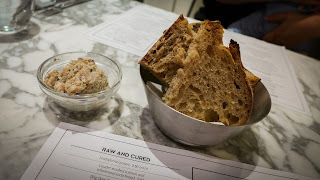 What we got was more akin to an under-seasoned loose country pâté of pork. If we’re going to get right into it, I’ll allow that in Germany ‘schmaltz’ may be made with pig. But over here, I’d query the use of that term when serving anything quite so powerfully un-kosher – or at least they should have warned me. A touch of seasoning also prevented a couple of nice starters being really excellent. 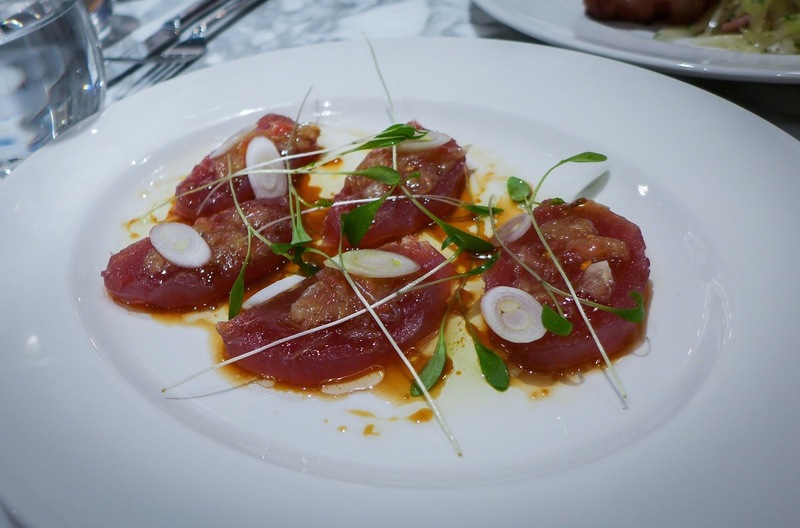 A plate of raw tuna topped with grapefruit (£8.90) was crying out for a few crunchy flakes of Maldon. 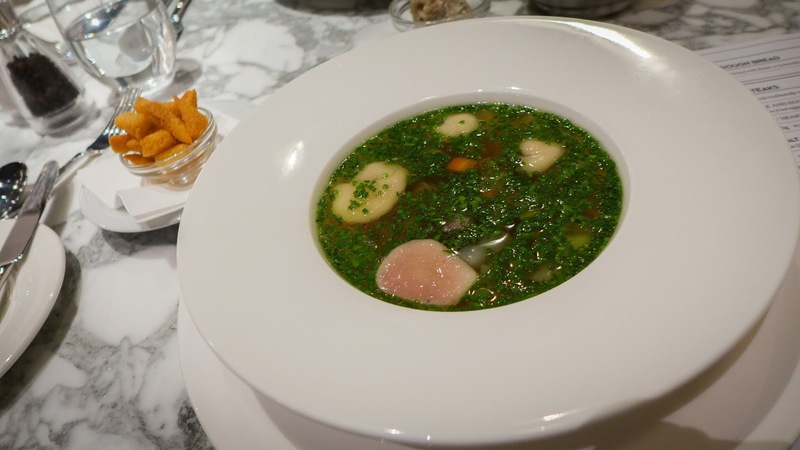 An impressively clear beef consommé (£6.50), bobbing with nubbins of silky bone marrow and whose depths were obscured by a scatter of chives, also could have done with a turn or two of the salt mill. On the other hand, there were no such issues with a lump of sugar-pit belly rib which, having been cured, then dumped in sugar for a week, was sensational: pink folds of meat and unctuous fat fell away from the bones, the whole perked up with mustard and a good fennel-forward sauerkraut. 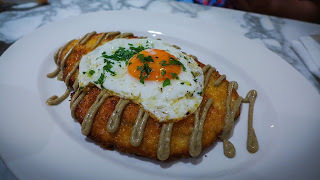 This was a delicious way of spending £5.20 - my wallet had avoided the Dom Petroff Ossetra caviar (£55). One of us had to try the steak of course, but Mrs Diner had an issue deciding on her main as everything sounded ridiculously appealing in an old-fashioned and comforting sort of way. Grilled lamb chops, hash and eggs, steak and burgundy pie or calves liver and bacon? It could have been any of those, but she settled on a chicken schnitzel (£12.60), lubricated by a criss-cross of truffle mayonnaise and topped with a crisp-bottomed fried egg. The crumb coating stayed crunchy to the last, while the bird was cooked to moist succulence. Mittel-European perfection. Side dishes were very strong. 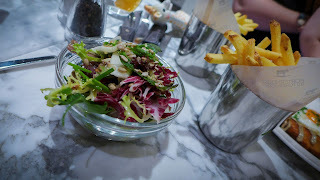 Skinny fries were rustly and golden, while a perfectly dressed side salad had an admirable number of different components including sage leaves and toasted sesame seeds. Its bracing bitterness was a welcome reprieve from the acres of meaty richness it accompanied. On which note I have to mention one of the most ridiculous gravies I’ve ever tried, a triumph of reduced wine and stock with yet more bone marrow turning the beef-ometer up to eleven. With that fabulous steak, it was almost too much. Almost. The whole operation seemed to be running smoothly. 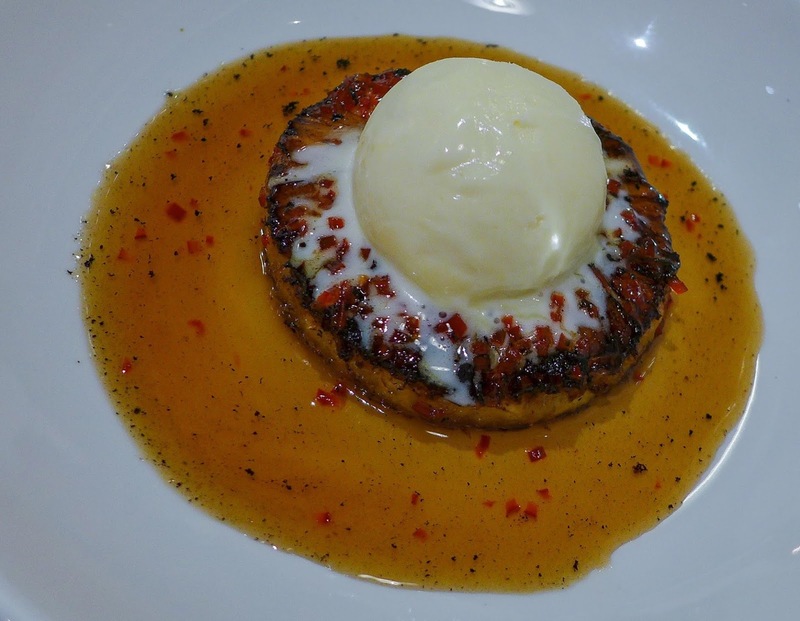 Service was, as it is at all of Laybourne’s places, equal parts sharp and charm. The fit-out is lovely, with marble tables, cream leather stools, pretty tiles and wood to the fore. Porterhouse is the meaty ying to the fishy yang of Saltwater Fish, which sits opposite and with which it shares a kitchen. Both allow you to either buy raw product of seriously high quality to take home, or have it cooked for you in the restaurant. For me, the only issue is that both of these excellent establishments, being in Fenwicks Food Hall, close annoyingly early – between 4pm and 8pm depending on the day of the week. Also I can’t let this review pass without pointing out (again) what a farce it is having to trek through Fenwicks to find a loo. There had better be good reasons why they couldn’t put one in the food hall itself. 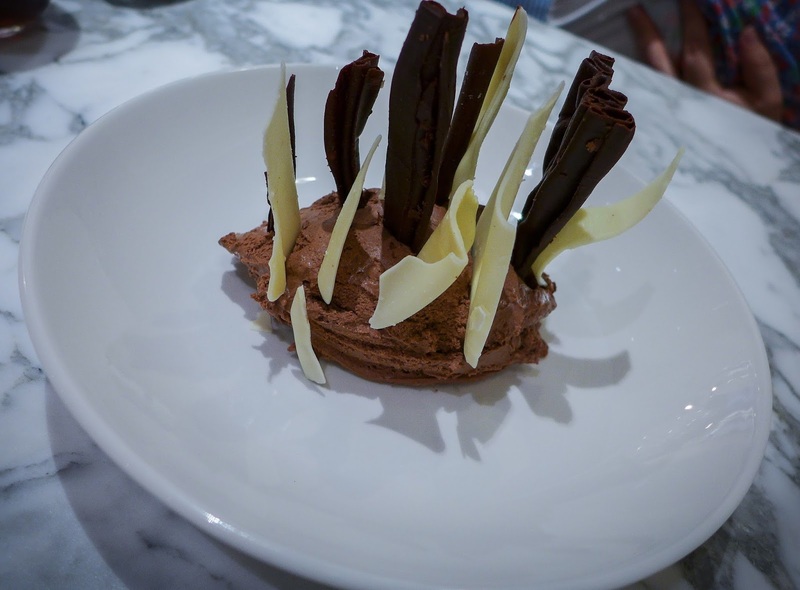 We finished with the same (excellent) chocolate mousse they serve at Saltwater Fish. And there was a delicious grilled pineapple with chilli caramel and coconut ice cream, which was all kinds of tropical. The menu at Porterhouse has real depth and breadth. On the basis of this visit, there are a couple of minor kinks to iron out in its darker corners. But most people will be coming here for the steak, and in that regard all is very well indeed.